Passengers step from Amtrak’s Coast Starlight No. 11 after it arrived in Albany on Saturday from Seattle and Portland. 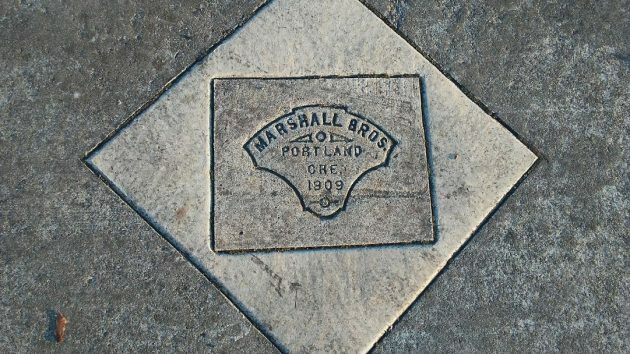 So who were these Marshall Brothers? They were R.A. and J.A. Marshall, and at the time they were running “the largest and most profitable cement contracting business in this city” since moving their company from California to Portland in 1902. Gaston’s book on Portland luminaries is about R.A, who was born in Illinois in 1869 and moved with his mother to California when he was 8. With little formal schooling, he got into the newspaper trade at age 15, first in San Leandro and then, in 1887, at the Burbank Times. Later he became manager of the Newhall Times and San Fernando Times. R.A. also had an interest in public office. In Los Angeles he served as justice of the peace, city judge, police judge, deputy county clerk, and eventually chief deputy clerk and later, in San Francisco, secretary of the California Supreme Court. He quit that job in 1901 to put more time into the cement company with his brother. The next year they moved to Oregon. R.A. did all this single-handed, you might say. At age 14 he lost an arm (Gaston doesn’t say which one), when he managed to save a 10-year-old boy who had “fallen into a flue” but lost his own hold at the last minutes and fell 42 feet. Being in the concrete paving business, the brothers and their men did a good deal of driving. In January 1911 the company wrote a letter singing the praises of the 1909 Hupmobile they had bought in 1910. Now it had 20,764 miles on it and was on its second set of tires. “Our work requires the most severe use of the machine,” they wrote, “taking us on long runs, many times having to push it as hard as it will turn for many miles. It has never overheated to the extent of giving any trouble. Our business frequently requires driving over newly laid crushed rock, through brush and around unbroken land and we never hesitate about setting out for a point whether it be over mountains, crossing streams, or plugging through the mud or slush. Say what you want about Google and the Internet and their invasive presence in everyone’s life. You can’t help but be intrigued by what you can learn on your laptop about a company that laid down the concrete at the Albany depot more than a century ago. Well……. at least you weren’t doing the “Millennial Head Nod” to mess with your electronic device & not paying much attention to your surroundings.